A New Map of the World in the Globular Projection. 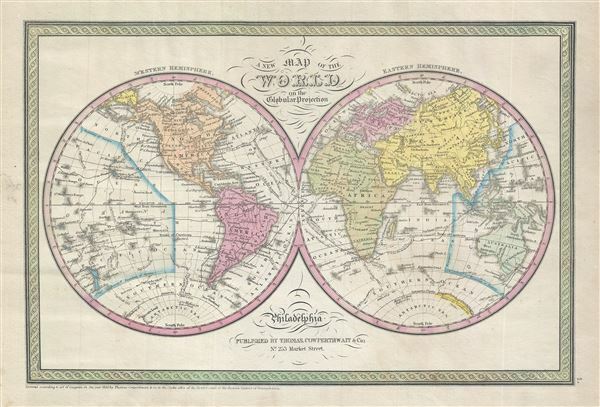 This is a beautiful hand colored map of the world published by S. A. Mitchell Sr. in 1850. Depicts the world on hemispherical projection and offers a fascinating snapshot of the world during a period of rapid globalization and discovery. Africa and Australia are largely unmapped in the interiors with coastlines accurately rendered. The coast of Antarctica is drawn in sketchily, based upon early expeditions. The map is color coded according to continents with counties named but their boundaries not defined. Various important cities, rivers, islands, mountain ranges, and several other topographical details are noted. Mitchell, S. A., A New Universal Atlas Containing Maps of the various Empires, Kingdoms, States and Republics Of The World, (Thomas Cowperthwait & Co., Philadelphia) 1850. Rumsey 3803.005 (1853 edition). Phillips (Atlases) 809.